Bottom line up front: A good choice for a daily carry comb. Handy size, indestructible and useful for more than just combing the beard. A few weeks ago I got a package from Pereira Shavery that - along with other nice things - contained a metal beard comb of the general size and shape of a credit card. Ever since it's lived in a pocket of my work clothes, begin pulled out and used every time I need to get my somewhat unruly goatee under control. So what have made this comb my daily carry? Firstly, the handy size. It sits comfortable in a pocket, in a vallet, a credit card holder, or in the back of my cell phone holster (careful not to scratch the cell phone though). That means it's always there when I need it for combing or other tasks. Secondly, it's metal and easily survives daily carry. In the past I've bent plastic combs and broken wooden ones. This metal combs just takes the abuse and keeps going... and the form factor makes it more resistant to bending than most other combs I've used. Thirdly, it got a few handy other uses. The built in bottle opener works well, the little flat head screwdriver in one corner have come in handy on a couple of occasions (sometimes the right tool is the tool at hand), the so called can opener on the end have come in handy as a letter opener as well as lifting the ring on the end of soda cans... I've not yet got to try the spanner (wrench) yet, since every time I've had to unbolt something I've had better tools at hand, and I'm not entirely certain what purpose the elongated hole between the spanner and comb is supposed to have. 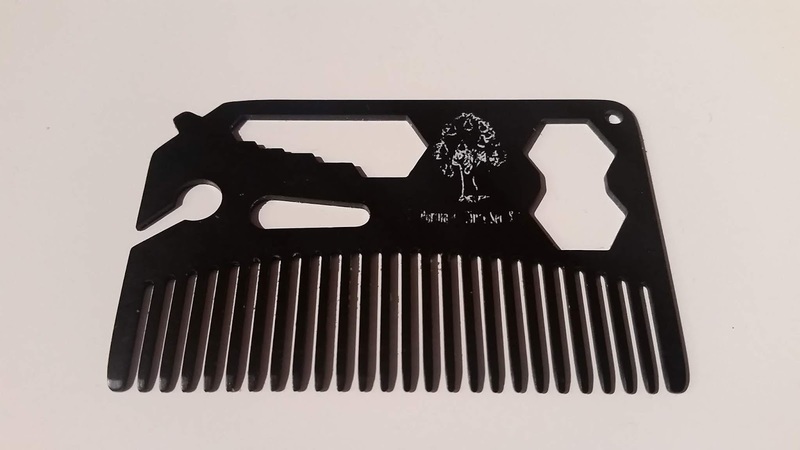 The most important part is off course the comb, and the comb works very well for me and my curly beard hairs. It can get hung up on tangles, off course, but nothing a bit of care can't work trough. Can I recommend the metal multi-utility comb from Pereira Shavery? For a daily carry comb, yes. I've carried it and used it daily since I received mine, to the point where I've managed to wear of the markings on the back. For a comb that lives in your bathroom or shave den? It'll work just as well there, but Pereira also offers some better options in wood for that purpose. (07-18-2018, 08:23 PM)WegianWarrior Wrote: Bottom line up front: A good choice for a daily carry comb. Handy size, indestructible and useful for more than just combing the beard. Not sure if it for the same thing here, but the elongated hole shape is common on sailing knives/tools and is used for opening shackle pins. Applying the multi-tool concept to a pocket comb is certainly creative.